It looks beautiful! I love your carpet choice! Just perfect! And those floors! Gorgeous! 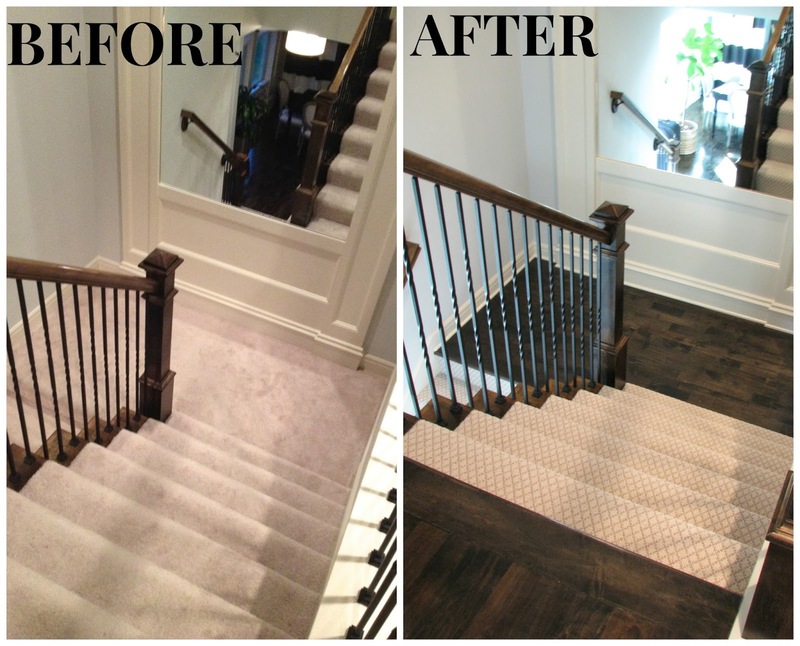 The stain color looks great and love the stair carpet choice! Yesss, I had been waiting for you to post After pics of the hardwood install! We are debating about the same thing right now...we are remodeling the entire upstairs of our home (tile, trim, floor coverings, countertops, light fixtures, paint, etc) and really want to do hardwoods in the hallway. 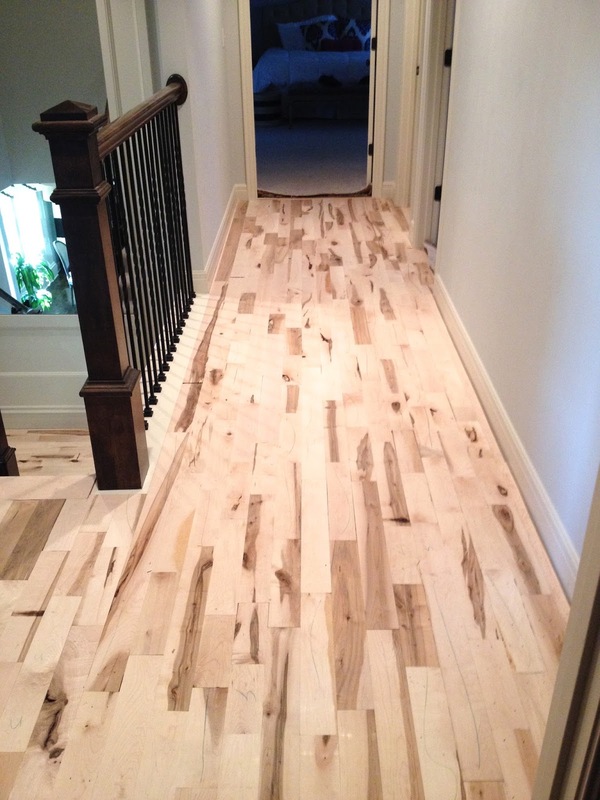 However, down the line we plan to do hardwoods on the main floor, and really want to tie the two together. So, I think we're going to do what you guys did - deal with carpet upstairs for a short time, then upgrade to the hardwoods later. Yours look GORGEOUS. And the impact they make against the white trim and painted walls just reconfirms that that is in fact what I want to do with ours eventually. Love it. Thanks for sharing, Andrea, as always!! Annie - so exciting that you are remodeling! Are you DIYing any of it? I can't say enough about the hardwoods in these areas - worth the wait and the $$!! Your floors look amazing! Such a beautiful update. 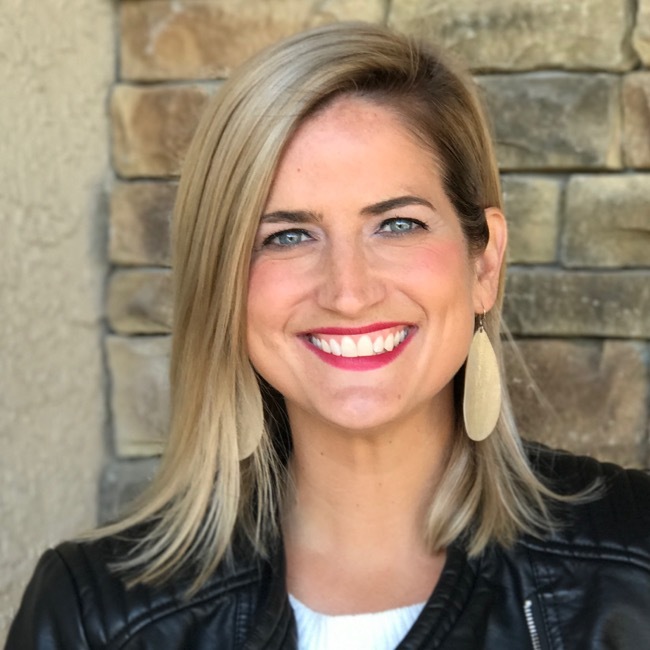 Love this and was so excited to see it on your blog as it's what we plan to do ASAP. We hate our upstairs carpet so will be replacing it all and doing hardwood on stairs and in hallway too. 2 questions for you: You mentioned that by waiting you saved yourself money, I'm guessing you did some of it yourself? Forgive me if you mentioned this, my reading comprehension might be off. We have no carpentry skills so will pay for it all and I'm guessing it will be pretty pricey. :( Second, how did you decide on carpet vs. hardwood for the stairs? I haven't looked into all the pros/cons. We were leaning towards just doing hardwood for the stairs as our kids should be over the falling down stairs period, but maybe that is unnecessarily risky as we don't plan to move for a long time and might have an unexpected fall at some point?? Thanks for any input! Hello! Thanks for stopping by! 1) We paid to have all work done. We saved money by not having the builder do this when we first moved into the house 2 years ago. It was an upgrade, and at the time, it wasn't in the budget. By waiting two years, we were able to contract the work out ourselves, saving money from having the builder do it. It depends on the size of your hallway, but ours came in well below what we expected it to be. I think you will be surprised. 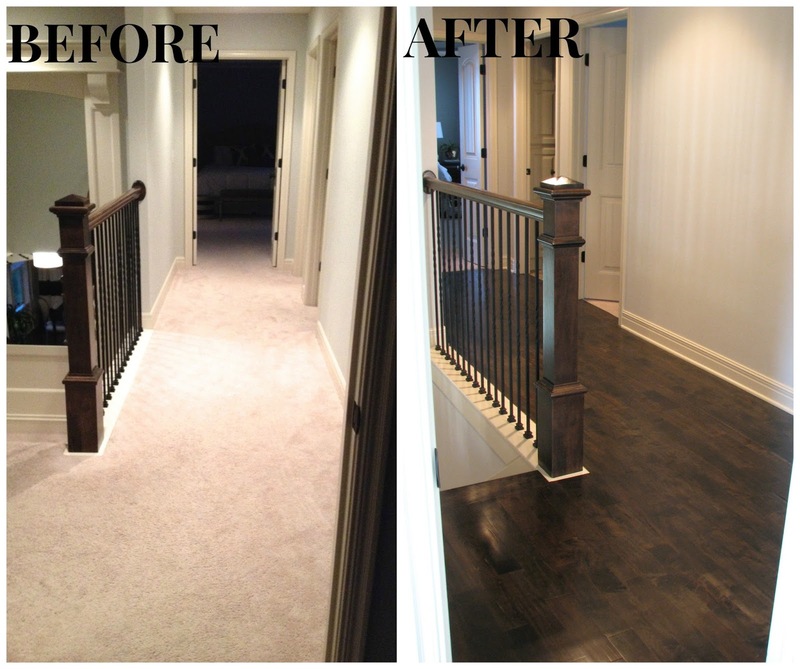 We used rustic maple floors and purchased more expensive stair carpet, and it was still surprisingly affordable. We had 2 quotes before deciding. 2) We decided on carpet on the stairs because of kids. We didn't want the issue of falling. We already slip and slide on the hardwoods in the hallway with socks on, so I know it would have been an issue on the stairs. I think the carpet also helps soften some of the dark, hardness of the hardwoods. 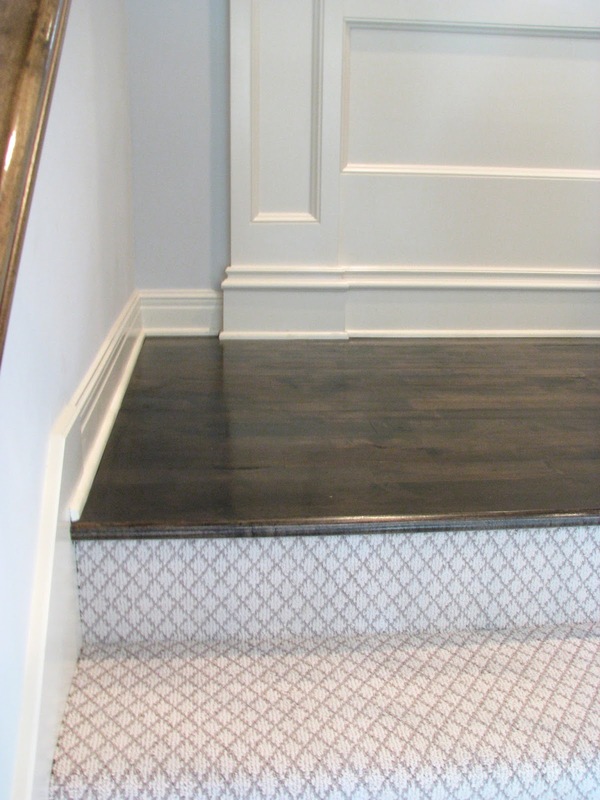 I absolutely LOVE the look of hardwoods on the stairs thought, so I don't think you can go wrong. I hope this helps! Let me know if you have any more questions! Hi there. I came across this post because I was googling "wood on landing." I originally wanted wood stair treads and have been shopping and pricing carpet and wood. 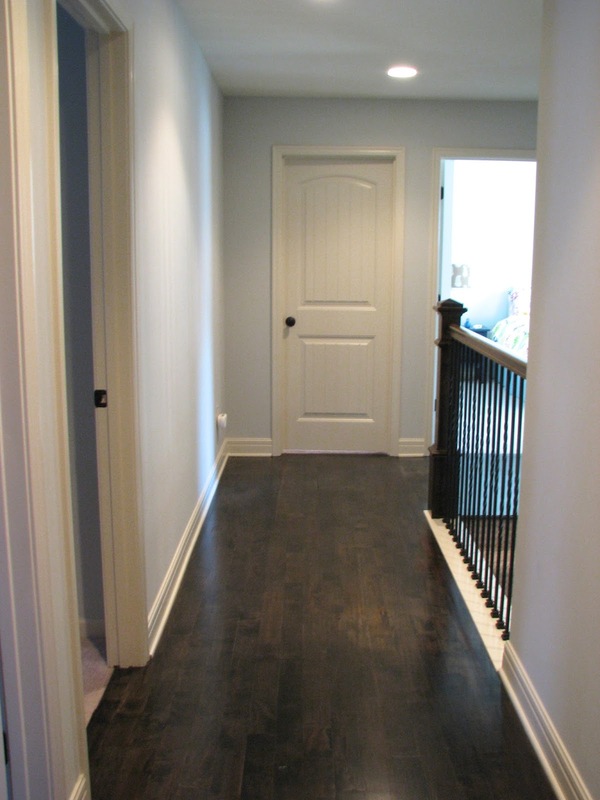 We will also be doing our upstairs hallway as well. Wood stairs, whether you use your wood floor as the treads, or have a stair guy put in solid treads, will cost you at least $2500 to $3000 due to labor. Doing carpet on my stairs (a nice carpet) and wood on my landing much like livelovelarson, will save me about $1200. My kids are older (12 and 14), but even adults slip on stairs, and we will be old one day, so carpet it is! There are some really interesting carpet choices out there that you do not need to match to other carpet in your house. I have even seen animal prints. Look at RealSimple magazine editor sitting on stairs with leopard print. You have to be daring to put this in. My family won't let me put in the tan zebra print I want to do. But if you look at Stanton carpet, you'll see some very fabulous geometrics and grid patterns. Those are high end and will cost around $1200 for 16 stairs. Good luck! Andrea, I love this- I have bad knees and often slip on my stairs. Do you just have wood on all of your landings and carpet on all stairs? Hi Andrea! I love this carpet and we are doing a smokiest project for the stairs and hallway. Would you mind sharing the details of the brand of carpet and name? Thank you! Two years later...do you recall the brand name and style of carpet? Thank you so very much. I had my heart set on the look you created I just love it. You make a really good point about the color showing dirt...I had not considered that. Do you happen to have a picture with the darker carpet? I'm visual and your posts have helped me a lot. Thanks again. Hi Andrea, I’m doing my upstairs with pergo and carpet on the stairs. Your setup was my inspiration. Do you happen to recall the brand and color of your carpet? It’s absolutely beautiful. Thanks! I'm sorry I don't remember the name/brand of the white carpet! We ended up replacing this stair carpet again when we renovated our basement last year. The white ended up showing too much dirt, so we changed to a dark charcoal and we are much happier!!! I love the look of the white though!! Do you happen to recall the brand and color of your carpet? Im redoing my house right now and fell in love with your carpet. Thanks!